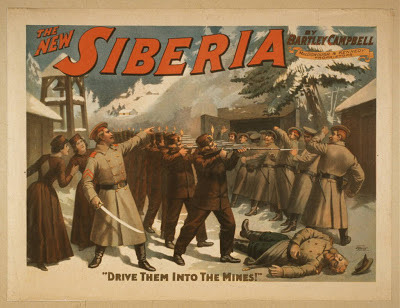 Title: The new Siberia by Bartley Campbell. Date Created/Published: Cincinnati ; New York : Strobridge Lith. Co., c1896. Medium: 1 print (poster) : lithograph, color ; 78 x 102 cm. Created and "copyright 1896 by The Strobridge Lith Co, Cincinnati = New York." Caption: Drive them into the mines!